Let’s start immediately by saying what is not. If at first glance you thought that Green Wedding is a vegetarian or vegan wedding, I’ll tell you right away that you’re off the road. So if you want a dinner or a wedding lunch with meat or fish, the Green Wedding will not stop you from fulfilling your desire. If, on the other hand, you are vegetarian or vegan, Green Wedding is the best solution you can find to live an unforgettable day in respect of nature. Respect for nature, in fact, is the basis of the concept of Green Wedding. The key words to describe this type of marriages are eco-sustainability, environmental friendliness and ecology. Green is the color of nature that we must necessarily respect in every activity we do. In recent years, sensitivity and attention to nature has grown, so Green has become travel, home furnishings and even marriages. 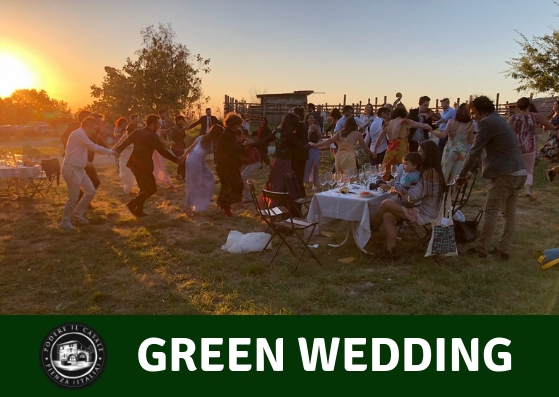 Green Wedding is a new trend that respects the surrounding environment in every aspect of the ceremony, from furnishings to ornaments, from the movements during the day to the food you eat. If you are thinking that organizing a Green wedding can take away the charm and elegance of the most important day of your life, we want to reassure you by explaining in detail, what precautions are taken in a Green Wedding to be able to respect nature. WHAT IS A GREEN WEDDING CONSIST OF? Preferring local sellers and products is the first step. In all the purchases that can be made for a wedding, privileging local sellers is a way to support their territory and make fewer trips by car, therefore pollute less. Still for the pollution talk another solution is to celebrate the ceremony and hold the reception in the same location. The seasonality and the locality of the products on the menu is another thing to consider in a Green Wedding. Choosing seasonal products not only respects nature, but will also have better and tastier foods. In addition to food, floral decorations should also be seasonal and local and should beautify a location that is eco-friendly. What’s also needed for a wedding? Invites and bonbonnieres. Participations can be printed with vegetable-based inks on recycled paper. For wedding bonbonnieres, we could avoid the classic knick-knacks that no one wants to exhibit at home and throw us into a creative idea for a souvenir object that can be used by those who receive it. These are essential bases for a Green Wedding with flakes, which respects nature without taking anything away from your wedding. At Podere Il Casale you can organize your green wedding among the Tuscan hills. The breathtaking view and the farm oﬀer a unique setting to create unforgettable memories. Our menu is always based on the organic products made on our farm, if you are looking for a genuine farm to table experience – this is the right place. Every event can be tailor made up to the very last detail, this means that your guests could for example also take part in our farm activities. Our farm is suita-ble for every kind of ceremony and could host up to 120 guests.